Samsung device is not perfect but the best phones in Android market. It becomes much more popular than before due to its better camera, bigger battery, perfect size, IP68 certification for water resistance…so are you ready to give up your old iPhone 5/5C/5S/6 for the newly released Samsung Note 7, Galaxy S7/S7 Edge? And here is a question for you after switching from iPhone to Samsung: How do you transfer everything from the old phone to the new one? 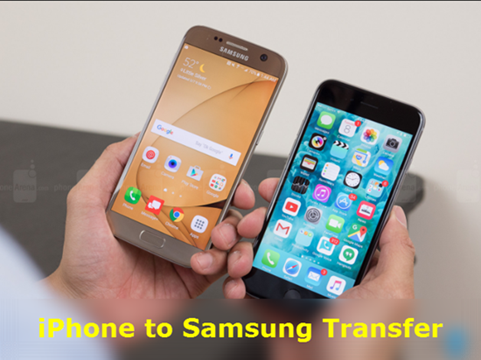 To solve the problem above, Samsung has developed Samsung Smart Switch to help users transfer information from iPhone or other devices to the new Samsung device. 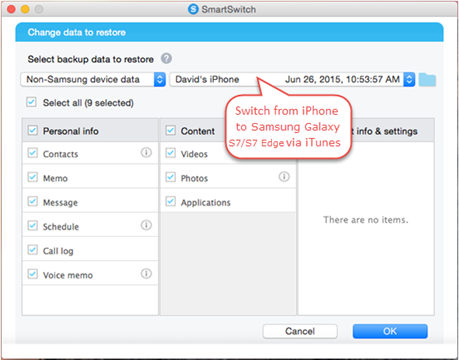 The small utility allows users to sync iTunes/iCloud data to Samsung conveniently. Back up your iPhone with iCloud. Install Smart Switch on Galaxy device from Google Play Store. Open this app and select “iOS Device” as old device, tap “Import from iCloud” and sign in iCloud with your Apple account. If you have successfully logged in, you would find a list of basic data categories displayed. Choose the data that you want to move and click “Import” to start transferring process. Download Win/Mac version of Smart Switch on computer. Launch this app and connect your new Galaxy S7/S6 to PC, after connection, you can view 3 options: Backup, Restore & Sync. Tap “Restore” option, then click “Change Data to Restore”. Now tap on “Non-Samsung device data”, select the content you want to transfer, click “OK” and these selective items will be exported to the new Samsung. 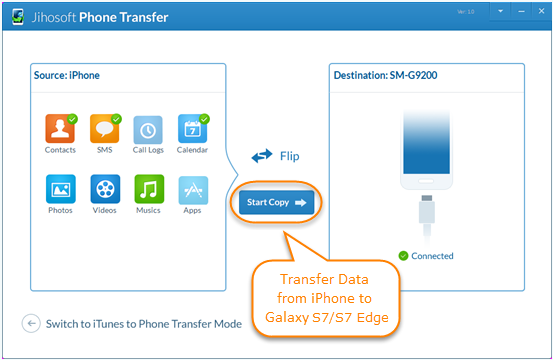 Aside from Smart Switch, Jihosoft Phone Transfer is another one-click tool to help users transfer contacts, photos, videos, sms, musics, notes from iPhone to Samsung. 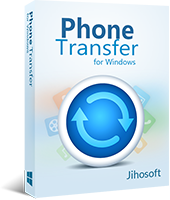 Once you have downloaded this program from official site of Jihosoft, launch it and click “Phone to Phone” tab. Connect both of your iPhone and Samsung to computer using 2 USB cable. After connection, this program will display all of the file types of iPhone. Select any items that you wish to transfer, click “Start Copy” and this software will begin to transfer selective items between the 2 devices.